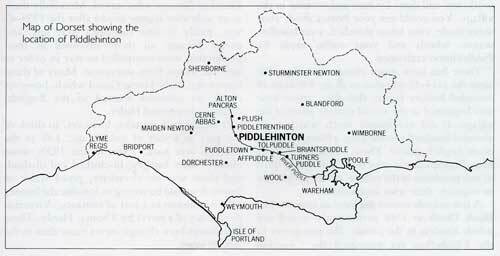 Concerned about the continual loss of social history in communities generally, in 1987 the Piddlehinton History Group was formed to gather and record for posterity as much detailed local information as possible about their village. So much material was gathered that 2 separate exhibitions were held, in 1988 and 1998, and it was decided in 1990 to publish some of the information in the form of a book. This Website edition is a larger 1998 version of that book with some amendments, updates, additional text and photographs. The Dorset village of Piddlehinton lies between chalk downs in the valley of the river Piddle 5 miles north of Dorchester. It now has (in 1990) a population of just over 400, over 25 new houses having been built here in the last 10 years. It has a church, a post office and shop (now closed), a village hall (in the old village school) and a War Memorial, all in the village centre where its 2 roads cross. It also has a pub. This book results from an exhibition of the history of the village we put on in the village hall at Easter 1988. We all became fascinated by the many bits of historical jigsaw we were able to unearth. Dividing the subject matter between us, we spent many hours searching through records at the Dorset County Record Office, the County Library, the County Museum, Eton College archives, Church House Westminster and local lawyers and estate agent's offices. We also pressed past and present residents of the village and a local historian to dig out any relevant papers, photos or memories for us. We are much indebted to all these people who took a lot of time and trouble to help us. Reluctant to let our exhibition become an archive itself, and fired by the tremendous enthusiasm for knowledge of Piddlehinton's past expressed by so many of the Exhibition's visitors, we resolved to translate that exhibition into this book. It is but a small sample of some of the fascinating wealth of information that awaits more serious historians. It was our curiosity about life in Piddlehinton in previous centuries that led us on. All history is the story of change and it continues to be told daily in Piddlehinton, as everywhere else. We hope you will enjoy this record of some aspects of change in Piddlehinton since 4000 BCE. Susan Belgrave, Angela Drewe, Wendy Gregory, Naomi Smeeth, Tessa Spiller, Gillian Vickery, Judith Wardlaw. ACKNOWLEDGEMENTS We acknowledge our gratitude to the following: The Dorset Natural History and Archaelogical Society, especially Roger Peers, Curator, and Judy Morris (photographs and extracts from Dorset County Chronicle); The Provost and Fellows of Eton College, especially Mrs Hatfield, archivist (photograph on p, 12 and excerpts from their archives); The Royal Commission on the Historical Monuments of England (1867 plan of church); Hanford Farms Ltd; The National Society, Church Home, Westminster (details of nineteenth-century schooling); Messrs Hall & Woodhouse, Blandford (photograph and details of the New Inn); Dorset Police, especially P.C. N. Frisby (extract from Tile Dorset Constabulary); Stone's Monumental Masons, Weymouth and Dorchester (information about War Memorial); Tile Piddle Valley Book of Country Life', Dorset County Record Office; Dorset County Reference Library, Dorchester; Dorset County Library; Dorset Military Museum; The Lock Collection, at Dorset County Library (for photographs of and paintings by Mary and Kate Hardy); Robert Machin, University of Bristol. We are also very grateful to everyone who shared their knowledge of Piddlehinton with us and to the many who contributed photographs. 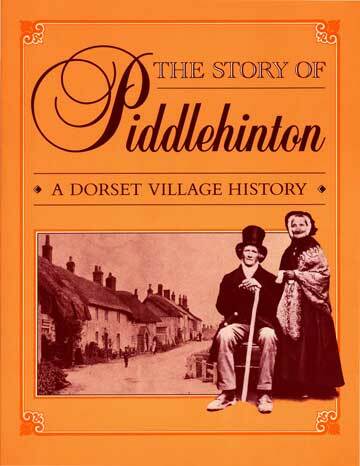 This Story of Piddlehinton is copyright © 2014 by Piddlehinton History Group. It may not be reproduced in part or in whole without the written permission of the Group. The Group does not accept liability for any inaccuracy or omissions or anything arising therefrom.